Remember the story of Goldilocks and the 3 Bears? Everything came in threes and she explored their house trying each chair for softness and food for the right temperature. I decided to call my latest finish Goldilocks because I used three different size blocks for the quilt. I am just in love with this quilt! I made it from odd sized leftover bits of fabric. The FMQ is a loop design and I'm so proud and happy of the job I did. FMQ is a journey and this was the first time that I got the tension right. The stitch length isn't consistent but the texture is amazing. The middle border is pieces and I love the way it looks. I pieced a bit of the back. Pieced backs are not my usual thing but I'm happy with this one! This quilt finishes at 60 x 66'' and is perfect for napping! I'm busy working on a pattern for Goldilocks and can't wait to share! Goldilocks will be linked up with Main Crush Monday's, Freemotion by the River, WIP Wednesday's, Let's Bee Social, Midweek Makers. Needle and Thread Thursdays, Finish it Up Friday and Finished or Not Friday. Looks great Patty :) You can never go wrong with a churny!! I like the bits of orange in your quilt...and it is nice to see you having fun with the fmq! Sweet fabrics. Love the way this turned out. What a great name for the quilt. Beautiful finish! 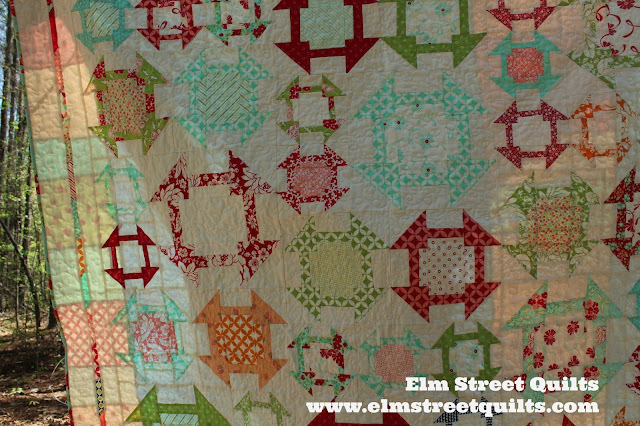 What a great quilt - fun name too! Love all the colours in your quilt. Great finish. So so pretty! I love the beautiful colors and the churwndash blocks are always a traditional favorite. You should be pleased, Patty. Love the variety in the blocks. Thanks for the closeups on the quilting. Great job on Goldilocks. Love it. Awesome quilt! I really like that you quilted it yourself. Great job! Excellent quilt and what a perfect name! I love all of the scrappy, different sized blocks. 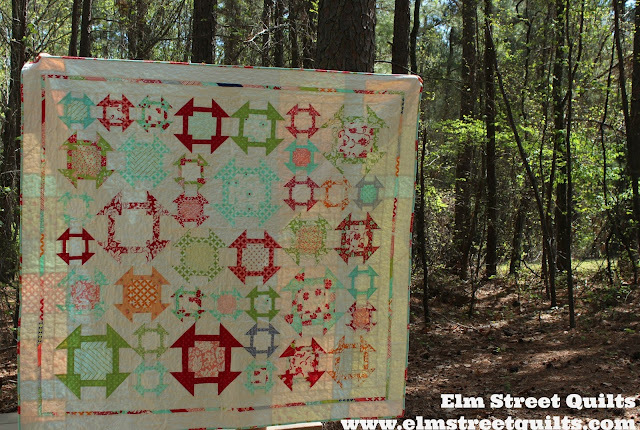 Clever name for a very pretty quilt. You can always spot a Bonnie & Camille fabric line a mile away. Not sure which one this is, but I love it. It's fantastic! Isn't it a great feeling when the quilt is finished and it turned out so well?!? !